This is my wifes Jaguar XJR. The engine is a 4.0L DOHC 4-valve-per-cylinder V8 engine. This is the supercharged (most appropriate for me) and intercooled R model developing 370HP and 387ft*lbs of torque stock. It uses the proven Eaton M112 Roots type positive displacement supercharger and water-to-air intercoolers. The car will hit 60 mph in just over 5 seconds and run the quarter in the 13's stock. It comes stock with 255/40WR18 tires, sports handling suspension, 5 speed auto overdrive trans, and much more. It is 400lbs lighter than my XJ12. 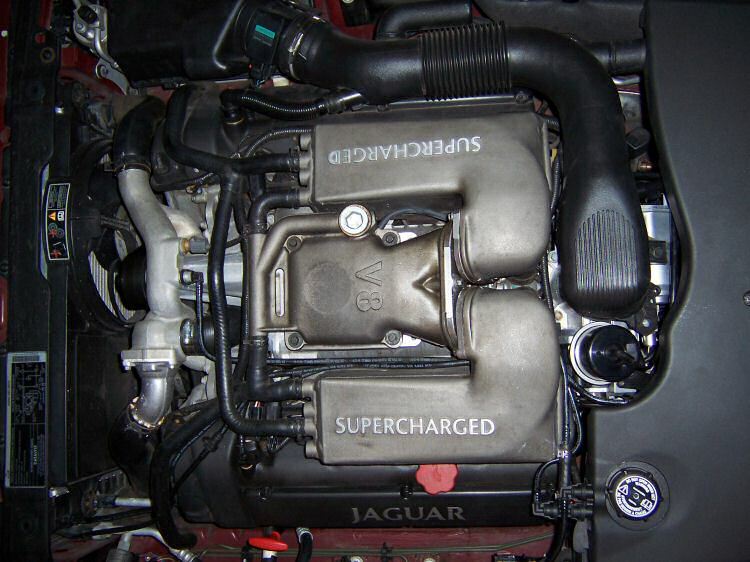 1998 was the first year of the X308, and the Jaguar V8 engine in the sedan (the engine debuted in the XK8). The XJ sedans have a certain feel to them and once you have owned one for a while, nothing else feels quite right anymore. This car has that good feel that I had in the XJ12, except it is even better in this car. Compared to the XJ12, this car feels much lighter and more nimble. It handles extremely well, especially for its size and weight. Here is a photo of the engine bay. Notice the supercharger is located down in the engine V with the blower exit pointing up. It then feeds 2 intercoolers mounted over each bank of runners. The intercoolers are water to air (you can see the water plumbing in the front). I have not done much to the car yet. So far, I had it aligned and installed a new set of Continental ContiExtremeContact tires. These are W speed rated (168mph) yet they are all-season ultra-performance tires. The alignment and tires was done at Kauth & Mayeur, a local European specialty shop. Out of all the cars I have owned, this one just seems to suit my needs perfectly for a sedan. The suspension is firm but not harsh. The ride height is low but not to the point of dragging on anything. The engine makes great power everywhere. The car handles great too. It has all the right features and no gimmicks you never use. The exhaust sound is perfect, if not a bit too quiet. When you roll the windows down, you hear a satisfying deep rumble but it's very subtle with the windows up. The Blower is the quietest I have ever heard for a Roots (which means they over muffled the intake system and there is very likely some power to be had opening that up). In neutral the idle is actually a tad choppy but in drive it is glass smooth. 11-2006: I replaced the Continental tires with Goodyear Eagle F1 GS-D3. 12-2007: I installed a Motorola T605 Bluetooth car kit. Click here for details. This gives both hands-free cellular and I can stream stereo from the phones to the car stereo. Very nice. 10-2008: Upgraded to a K&N air filter and I went back to the Continental tires again. 4-2011: Sold this car at 154k miles. It had been a great car for us for many years but we wanted something newer and bigger. This photo shows my 1998 XJR (left) and my previous 1994 XJ12 (right). I owned both cars at the same time for about 6 months, until I sold the XJ12.